It is approximately 2000 Square Meters and is like a five-star hotel property. The Convention Centre is designed to International Standards - the stage, food arena, hand wash area, and restrooms are neatly segregated to make it a clutter-free experience. A Fully automatic dishwasher does the messy cleaning up of utensils and cutlery at a time for 2000 people. The Stage is enormous and has the trappings to handle a hanging "Mandap" up to 1000kgs and adjacent to a double bedroom unit for both bride and groom to change, shower, or extend their repertoire with a backdrop and seating arrangement for pre-wedding photography. 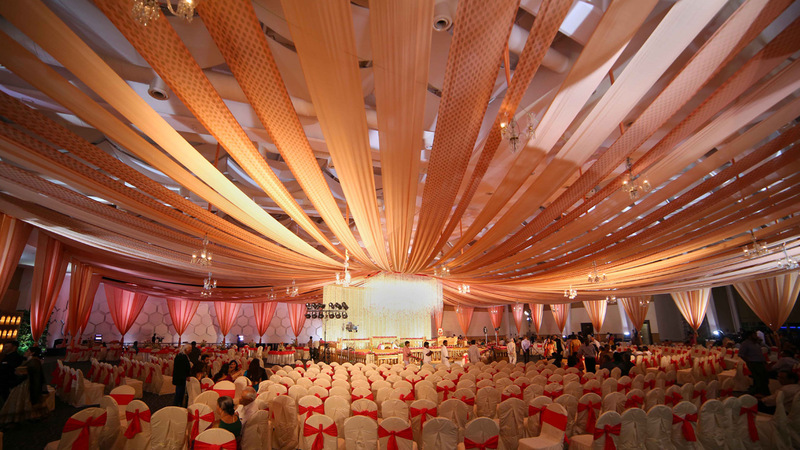 The acoustics inside the central hall is matchless, and the single piece imported carpet adds to the aura of the venue. A first in city function halls and convention centers is the theme lightning, which has rainbow colors, changes every 30secs, both inside and outside. The speakers to any corner for better audibility, with acoustics which can take up to 50 celebles for D.J Parties & Conferences. It has ample parking in and around for about 800 cars with experienced valets to make parking less cumbersome. Centrally air-conditioned which can chill the hall less than 8 Minutes. It can seat close to 3000 Guests. ♦ Fully air-conditioned Central hall with a 25 ft. high ceiling Sprawling formal lawns of 15,000 Sq. Ft.
♦ Value-added services like ticketing, accommodation, travel etc.